Testing thermal imagers is a very difficult task. Extended knowledge from different areas like physics, optics, electronics, thermal sciences, precision mechanics, metrology and practical experience with thermal imagers is needed to carry out effectively testing modern thermal imagers. There is rich literature on the subject of testing and evaluation of thermal imagers and there are also several standards that regulate tests of these imaging systems. However in spite of available standards, valuable books and numerous literature less experienced test teams have a lot of problems to carry out their tasks due to lack of a practical guidebook in field testing thermal imagers. In this educational section the book TESTING THERMAL IMAGERS written by Inframet CEO and published in year 2010 is offered. This book presents knowledge of the author on testing thermal imagers that was accumulated during over two decades of scientific work in the field of electro-optical technology interconnected with a series of practical projects, and direct involvement development of equipment for testing thermal imagers. 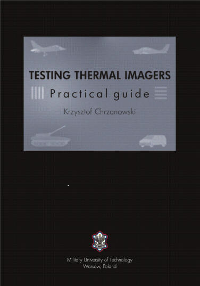 The author hopes that this book can become a practical guide for testing thermal imagers for wide community of people interested in this fascinating technology of thermal imaging. Nowadays, the part of this book that refers to test equipment is outdated. However information on parameters definitions and tests methods is still fully valid. Therefore reading of this book is recommended for anyone interested in thermal imaging, and especially for beginners to this technology. Chrzanowski K, Evaluation of infrared collimators for testing thermal imaging systems, Optoelectronics Review, Vol. 15, No 2, 82-87, 2007. Chrzanowski K., Li Xian-min, Configuration of systems for testing thermal imagers, Optica Applicata, Vol. 40, 4, 2010. Image is often worth more than thousand of words. Therefore a visit to another section of this website that presents computer simulators developed by Inframet is recommended. These are computer programs that simulate an imaging system by generating on computer screen images similar to images generated by the simulated imaging system.